Commission for a Hellsing fan with a theory: what if Alucard wasn't the Dracula...just a Dracula? Alucard's identity was perhaps the worst kept secret in Hellsing or any other manga. Besides his name, and the agency/manga's title, there were constant references, impalement of enemies, and a peculiar nickname for Seras (Draculina). As a character he was impish, selectively quarrelsome, loud, and delighted at his leash and mission. He seemed to lack Dracula's pride, something that wasn't to be found in his state but in his past and ancestry. Alucard also seemed too amiable to the Major, too willing to entertain Millennium's mad aspirations. Moreover, little seemed to rattle or enrage him, save when Father Anderson left his humanity behind to engage him in final combat. Even Walter's betrayal brought nothing but glee at the idea of fighting his oldest living friend. In short, Alucard is a fun character, but he wasn't my idea of a Dracula. Dracula, to me, is more prideful, hates his enemies and treats them accordingly with no empathy, and doesn't think of humans as existing on a higher plane (though this may be because he regards vampires as an offshoot of humanity). Finally, Dracula enslaved an entire class of society and worked them to death for betraying his father and family, so Walter wouldn't have been smiling as much as he was in canon when he died. Not liking Alucard as Dracula but liking him as a character, a number of years ago, something occurred to me: maybe Alucard isn't the Dracula, but it doesn't mean he can't be a Dracula. This occurred to me while rereading McNally and Florescu's Dracula: Prince of Many Faces and coming across the brief life of Dracula's older brother, Mircea. Mircea goes by the name 'Alucard' these days, largely for the brand. Vlad Dracula, meanwhile, has built a secret empire of the undead, a vast corporation that touches every continent, and a shadowy army. Vlad's younger brother, Radu, is a pestiferous headache, but he regards his elder brother with sadness and pity. Oh, Seras: so many surprises in so little time. You thought vampires didn't exist--you were wrong. You think you can still be human--you never will be again. You thought your Master was alone, like a volcano brooding over a lost island--but who is that coming out of the darkness, as if it birthed him? And Master is getting that look again, his lips stretched in that satanic grin, teeth gleaming and eyes sparking. In a flash of white and glints of metal his guns are in his hands, and this stranger only takes his eyes off Master to look at them coolly and speaks with a voice as dark as the ocean's bottom: "Fratele meu, nu-i așa?" And Master's grin only widens, becomes sharper, as he replies: "But, of course; how better to welcome my little brother but with the gunfire that is his due?" , being of course the artist and author behind the most extensive and beloved Hellsing doujinshi--as well being frequently open for commissions--seemed like a great fit to bring a scene such as this to life and I'm very pleased to say that this assumption proved resoundingly correct. She captured Vlad's grim determination and Mircea/Alucard's blithe aggression perfectly, and I love how innocent Seras looks to us here, still in a time and state where these things startle and scare her. A splendid job, coinciding with an announcement that she is preparing to return us to ASHN's beautifully orchestrated world once again. The cup is running over. Thank you very much, Erin. Working with you was an honor that I hope to repeat in the future. The "Shine return" was an April Fool's joke, but I do appreciate the compliments! Awww, I honestly thought you had an itch to scratch there. They were well earned, I assure you. 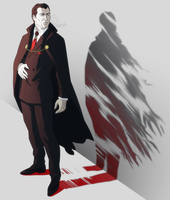 Alucard is Mircea, the oldest Dracula brother.